Twilight’s shadows covered the green expanse. A welcome cool settled on the tiny plot of open prairie. A hint of flowering wild mint fragranced the air. Sunset’s golden shimmer bathed a tall oak seventy paces beyond the cautious doe. But she plodded on, browsing on grass here and plucking a flower there. Every few seconds she perked her head up and looked to the west. Her tail hung at rest and her muscles showed no sign of tensing, yet she exercised caution. Ten minutes brought the doe inside fifteen paces. A butterfly breeze from the southwest, nose-on to the doe, did little to force flight. She browsed back and forth in front of the couple as if playing a woodland game, sneaking subtle glances. Even when she munched, those big brown eyes kept above the calf-deep grass. By now, a half-dozen other deer browsed in the northeast corner of the clearing. 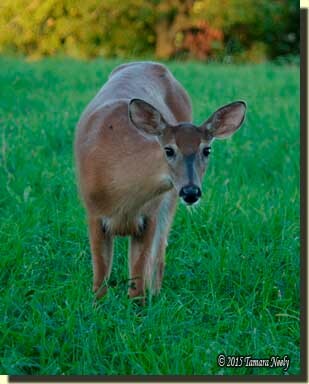 A sweeping, upright forkhorn in velvet kept the other deer between himself and the big gully’s dead oak. On any other night the forkhorn would have been the focus of attention, but the young doe’s willingness to venture so close proved more worthwhile and educational. One could count the deer-flies on her back, neck and forehead and the scuff marks in her cinnamon hair. As the light drew dimmer, the couple withdrew from the wilderness classroom and allowed the deer to browse in peace. Early August is a time of peace in the glade, at least that’s how I view my excursions. The Northwest gun travels unloaded, or is exchanged for the not-so-period-correct Nikon, depending on time, place and circumstance. During these evening jaunts, our thoughts turn to the upcoming hunting seasons, and preparations begin with great anticipation. I find myself looking at each knoll and valley as a potential station camp location. The cedar brush shelter is no more, thanks to a large dead limb that crushed the ridge pole. I doubt the cedar rafters of the old duck camp can support even the slightest of brush covering. By early September, I feel I have to settle on a location and style of abode for this year’s hunts. Unfortunately, available time, not historical significance, will be the governing factor for this season’s hunting camp, at least that’s how the fall is shaping up. Moccasins need attention, one leggin needs re-stitching, and a new strap for the Ottawa-style shot pouch is on the list. Range time for the “Old Turkey Feathers” is a must, replacing the woven sash…oh, I get frustrated just thinking through the projects, and prioritizing does not help much. The last couple of nights I have devoted an hour or so to the workbench. I made a muzzle rest for the Northwest gun, repaired a lock for a friend and last night I roughed out a new handle for the “Long Lake” trade ax. John Cummins, one of the blacksmiths in residence during the National Muzzle Loading Rifle Association’s spring and fall shoots, hand-forged the head based on an artifact found at Long Lake in Hastings, Michigan. 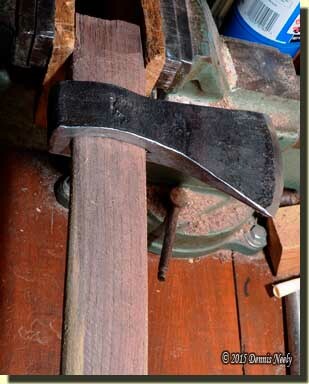 The ax is attributed to the 1790s, but this basic pattern spans many years. The ax weighs about a pound, as the originals did. The first handle I made did not grip well or maintain control of the heavier head. The only alternative was a new haft. After supper I headed to the shop and started splitting out a new piece of black walnut from a limb section a friend dropped off last winter. On the second attempt, I had a thin billet that showed promise. The band saw trimmed away the sapwood, and the draw knife flattened one side to my satisfaction. The head has a tear-drop eye, shaped with a mandrel driven in from the top during the latter stages of the forging process. Several of the eyes on original polled axes I’ve examined are formed in this manner, allowing the head to slide onto the handle and tighten as it is used, similar to the head design on a tomahawk. The billet was somewhat damp, which I expected. For me, the dampness facilitates the rough shaping. I tried to take off a minimum of wood—just enough to allow the head to slide up the haft with some gentle hand pressure—knowing the blank would shrink as it dried out. I got so wrapped up in this project that I never realized it got dark. Having the sound track from “The Last of the Mohicans” cranked up helped, too. Sweat dripped onto the wood. My elbows and shoulders ached. Yet I felt a great exhilaration as I worked the haft down. I stopped short of seating the head and set the blank aside to dry for a week or so. After the head’s final fitting, I think I might add a leather grip similar to one I recently saw on a pipe tomahawk on the Contemporary Maker’s site. I use my woodland tools hard. I don’t abuse them, but I expect them to perform their intended tasks, plus being adaptable in unusual situations. Even with the new handle, the tear-drop shape is not the best fit for my hand. For sure, it is an improvement over the previous attempt, but not optimum. Like all of my 18th-century accoutrements, experimentation in the wilderness classroom will be the ultimate test. And this original example of a leather grip opens some possibilities for future lessons and laboratory study. 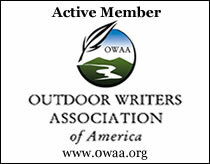 This entry was posted in Scouts, Wilderness Classroom and tagged Black powder hunting, Dennis Neely, historical trekking, Mountain Man, Native captive, North West trade gun, Northwest trade gun, trade gun, traditional black powder, traditional black powder hunting, traditional blackpowder, traditional blackpowder hunting, Traditional Woodsman. Bookmark the permalink. Dennis…August is much the same here in middle Georgia. I now have a half dozen deer walking through the back yard in the wood on the other side of a stream. A doe with twins, a single very skinny doe and two bucks. Also, like you, it is the time to find all my accouterments, do any cleaning and repairs and see if I can finish up some projects started with the intent of being done before this hunting season. Thanks for the reminder to get busy. Dennis : Here in PA I;ve had as many as three six pointers, in velvet, and eight turkeys in my yard at the same time. After almost sixty years at this I’m still trying to find out where they all go when the weather turns cold. I may figure this stuff out before I go to the Happy Hunting Ground.